Did you know that April is National Grilled Cheese month? We’ve been celebrating this super fun holiday for a few weeks already. Why? Grilled Cheese is all I’ve had time to cook lately! HA! And it is something that the whole family can agree on. Even our resident picky eater doesn’t mind a toasty, cheesy sandwich. Though he will opt for his without any extra special ingredient additions. I have always had a soft spot for grilled cheese sandwiches. Growing up we had an unspoken tradition that Sunday lunch after church was grilled cheese and a bowl of tomato soup. Back then our lunch was a simple grilled sandwich made with whole wheat bread and cheddar cheese and paired with a can of store bought tomato soup. Now, with my own family, we regularly enjoy this old tradition, but I like to keep things interesting by trying different cheeses, like Jarlsberg USA, and breads. After all, it’s a great way to make food more fun for kids and expose them to new varieties of foods they already eat. Serve up your grilled cheese sandwiches with homemade tomato soup and you’re sure to have a simple, delicious, and healthy meal fit for any day of the week. For our newest grilled cheese experiment we took our inspiration from a classic BLT sandwich and one of our favorite burgers – the ABC Patty Melt from Flying Star Cafe here in New Mexico. The result: Gooey melted Jarlsberg Cheese meets avocado, applewood bacon, arugula rather than lettuce, and sliced tomato. And of course, I couldn’t resist serving it with a bowl of Easy Florentine Tomato Soup (minus the pasta, plus a splash of cream). Want to get creative in the kitchen with grilled cheese? Leave a comment and enter to win this fun Jarlsberg USA Grilled Cheese Kit Gift Basket. Because sandwiches are very much about personal preference, feel free to use this recipe more as a guideline. If you prefer more cheese or arugula, for example, go ahead and adapt the recipe according to your personal tastes. Place the buttered bread cheese side up, butter side down on a griddle or cast iron skillet over medium heat. Cook until the bottom side of the bread is toasted and the cheese is melted. Turn down the heat on the stove, if necessary, to prevent over browning and/or burning of the bread. Add the cooked bacon on top of the cheese on one slice of bread. On the other slice layer the arugula, tomato, and avocado on top of the melted cheese. Press both slices together. 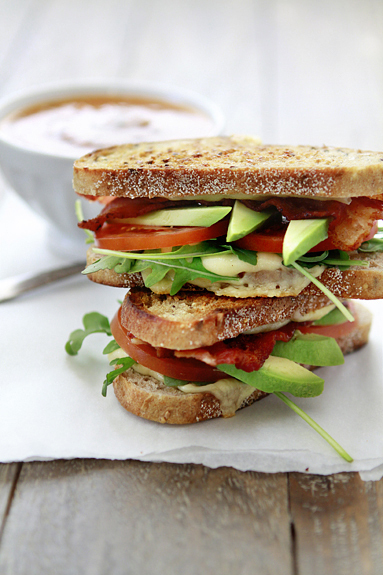 If the sandwich needs extra warming, cook for 1-2 minutes per side. Eat immediately and enjoy! 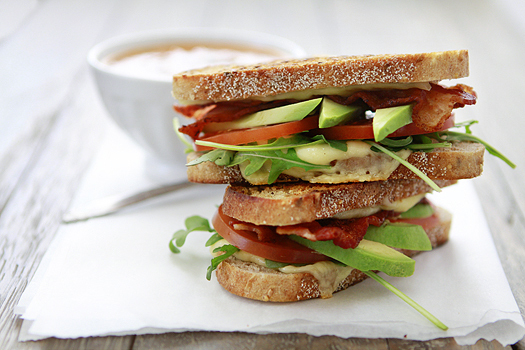 You can add the avocado, bacon, arugula and tomato to the sandwich before cooking if desired. I personally prefer my tomato, arugula and avocado uncooked so I add it in afterwards. Thank you Jarlsberg USA for providing this giveaway! Check out what Jarlsberg USA’s website and tell me what recipe or cheese you’d like to try. Contest ends May 2, 2012 at 11:59 p.m. PST. Winner will be chosen via random.org and will have 3 days to respond before disqualified and a new winner chosen. An additional entry can be earned by doing the following, giving you a total of 4 entries. Leave a separate comment for each of your entries. 2. Share your tip for the perfect grilled cheese on Jarlsberg USA’s blog post: Have You Mastered the Perfect Grilled Cheese?. Come back HERE and let me know you did, or I won’t be able to count an extra entry for you. I was compensated for my time and the giveaway fulfillment is provided by Jarlsberg USA, but all opinions and experiences with the product remain my own opinion.